Ramipril and Ramiprilat (active moiety obtained after metabolism by hepatic esterases) inhibit ACE in human subjects and animals. 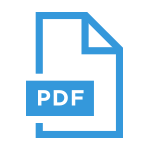 Angiotensin converting enzyme is a peptidyl dipeptidase that catalyzes the conversion of angiotensin I to the vasoconstrictor substance, angiotensin II. Angiotensin II also stimulates aldosterone secretion by the adrenal cortex. Inhibition of ACE results in decreased plasma angiotensin II, which leads to decreased vasopressor activity and to decreased aldosterone secretion. The effect of Ramipril on hypertension appears to result at least in part from inhibition of both tissue and circulating ACE activity, thereby reducing angiotensin II formation in tissue and plasma. While the mechanism through which Ramipril lowers blood pressure is believed to be primarily suppression of the renin-angiotensin-aldosterone system, Ramipril has an antihypertensive effect even in patients with low-renin hypertension. Aceril 2.5 Tablet: Each film coated tablet contains Ramipril BP 2.5 mg. Aceril 5 Tablet: Each film coated tablet contains Ramipril BP 5 mg.
Ramipril is indicated for the treatment of hypertension, to lower blood pressure. Lowering blood pressure reduces the risk of fatal and nonfatal cardiovascular events, primarily strokes and myocardial infarctions. It may be used alone or in combination with thiazide diuretics. Hypertension: Initial dose is 2.5 mg to 20 mg once daily. Adjust dosage according to blood pressure response after 2-4 weeks of treatment. The usual maintenance dose following titration is 2.5 mg to 20 mg daily as a single dose or equally divided doses. Reduction in the risk of myocardial infarction, stroke, or death from cardiovascular causes: 2.5 mg once daily for 1 week, 5 mg once daily for 3 weeks, and increased as tolerated to a maintenance dose of 10 mg once daily. Heart failure post-myocardial infarction: Starting dose of 2.5 mg twice daily. If patient becomes hypotensive at this dose, decrease dosage to 1.25 mg twice daily. Increase dose as tolerated toward a target dose of 5 mg twice daily, with dosage increases about 3 weeks apart. The most common adverse reactions in patients with hypertension included headache, dizziness, fatigue, and cough. Discontinue Ramipril if patient develops jaundice or marked elevations of hepatic enzymes. Pregnancy Category D. Use of drugs that act on the renin-angiotensin system during the second and third trimesters of pregnancy reduces fetal renal function and increases fetal and neonatal morbidity and death. Resulting oligohydramnios can be associated with fetal lung hypoplasia and skeletal deformations. Potential neonatal adverse effects include skull hypoplasia, anuria, hypotension, renal failure, and death. When pregnancy is detected, discontinue Ramipril as soon as possible. Lactation: Ingestion of a single 10 mg oral dose of Ramipril resulted in undetectable amounts of Ramipril and its metabolites in breast milk. However, because multiple doses may produce low milk concentrations that are not predictable from a single dose, do not use Ramipril in nursing mothers. There is possibility of excessive hypotension when Ramipril is used with Diuretics. Use of Lithium with Ramipril serum lithium levels and symptoms of lithium toxicity increases. Nitritoid reactions have been reported when Ramipril is used with Gold. NSAIDS use may lead to increased risk of renal impairment and loss of antihypertensive effect when used with Ramipril. Ramipril is contraindicated in patients who are hypersensitive to this product or any other ACE inhibitor (e.g., a patient who has experienced angioedema during therapy with any other ACE inhibitor). Co-administration of aliskiren with Ramipril in patients with diabetes is contraindicated. 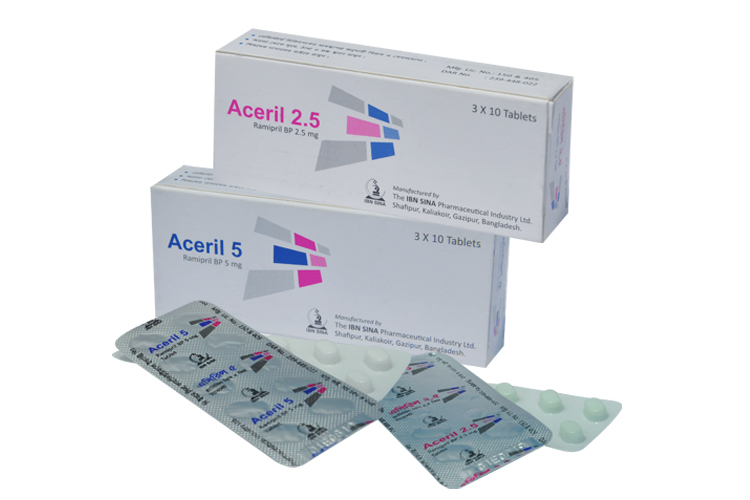 Aceril 2.5 mg tablet: Each box contains 3×10 tablets in Alu-PVC blister strip. Aceril 5 mg tablet: Each box contains 3×10 tablets in Alu-PVC blister strip.